A picture from a previous Myanmar-Vietnam engagement. Earlier this week, a Vietnamese naval vessel made what was characterized as the first such visit to Myanmar. The engagement put the spotlight on the naval dimension of the relationship between Hanoi and Naypyidaw and their defense ties more generally, which has been in greater focus over the past few years. 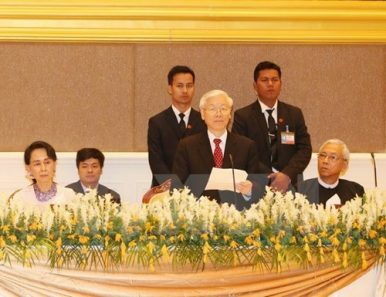 As I have observed before in these pages, Vietnam and Myanmar, two fellow mainland Southeast Asian states, have cultivated a defense relationship within their broader ties, with a memorandum of understanding on defense cooperation signed in 2010 facilitating interactions such as exchanges, and training. Over the past few years, both sides have tried to advance ties in various areas such as military medicine, military-run enterprises, and countering transnational crimes. They have also looked to advance ties between individual services including the two navies, with attention to various aspects including exchanges of expertise and visits. Those efforts have continued on into 2018 as part of ongoing efforts to both implement the comprehensive partnership established in 2017 and deepen defense ties as well. During Myanmar State Counselor Aung San Suu Kyi’s first official visit to Vietnam in April for instance, both sides stressed various efforts underway in the defense realm such as holding a regular deputy ministerial level-defense policy dialogue, inking a new agreement against crimes, and expanding cooperation in areas such as search and rescue. This week, the naval aspect of the relationship was in the spotlight again with what was officially characterized as the first visit by a Vietnamese naval vessel to Myanmar. Following a stop to participate at the 2019 iteration of the Langkawi Maritime and Aerospace Exhibition in Malaysia, the Vietnamese People’s Navy (VPN) frigate Ly Thai To made a scheduled stop in Myanmar’s Tanin Tharyi port on April 3. The components of the visit itself were familiar, including a welcoming ceremony and meetings by personnel on both sides. The Vietnamese side was headed by Nguyen Cong Son, the deputy political commissar of Naval Region 4, while several personnel from Myanmar were present including the commander of the Myeik Coastal Military Region and the minister of security and border of Tanin Tharyi Region. The true significance of the visit lay in the fact that this was the VPN visiting Myanmar for the first time, a point acknowledged by both sides as a boost for both the naval relations between the two countries as well as the defense relationship more generally. The Vietnamese military’s official account of the visit also noted that Tun Lu, the deputy commander of the Tanin Tharyi Naval Region of the Myanmar Navy had said that this would serve as an opening for similar visits of Vietnamese naval ships in the future as well. To be sure, this significance ought not to detract from the reality that this is just one of several engagements between the two sides, and that how exactly this affects the trajectory of the defense relationship, including the naval realm, remains to be seen. Nonetheless, it is a notable first for two consequential Southeast Asian states that is worthy of attention not just for its own sake, but within the context of broader regional trends as well. Vietnam Vessel Kicks off New ASEAN Maritime MissionJoint Patrols Highlight Vietnam-Cambodia Maritime TiesWhat’s in a Canada Warship’s Vietnam Voyage?Vietnam-Myanmar Military Relations in Focus with Defense VisitWhat’s in Vietnam’s New Submarine Vessel?